Few days ago, Google unleashed the brand new Nexus 5 with Android 4.4 Kitkat and i couldn’t help myself to spend few hours getting some crunchy wafer bar for my HTC One X. Don’t forget to take a break with kitkat! Disclaimer : This is not a post to talk about 4.4 Kitkat’s features or in-depth reviews as left and right around internet already has that. And no, i’m not using 4.4 rom yet as i am busy with work to build one right now, so i just proceed with something simpler. It didn’t take long for Kitkat’s apks to appear on internet. As usual, XDA’s got it first and they put 4.4 Launcher, keyboard, gallery and camera (now separate) and few other stuff to make it work available for download. I don’t really fancy for the new keyboard (brings system-wide emoji) and i know very well the new Camera with Photosphere are going to crash on me, so i’d just proceed with the brand new Launcher and Hangout to replace my current stock AOSP Mms.apk. I managed to get them up and running on my devices quickly without always-on “Ok google” function, but as soon as few reboots, it stops to work and failed to boot. So i need to figure out how to make it work at least on my devices. Turned out it was real simple. All i need to do is 1) get rid of stock Google Search Box 2) replace com.google.android.gms-1.apk in /data/app with 4.4. 3) Don’t forget ownership and permission, practice clearing out cache and dalvik to let the system boots up from fresh start and done. Everything works flawlessly now, including always-on “Ok google” voice search. It didn’t bring much changes, but whatever changed are welcome. I’d totally favor the new app button and transparency on the drawer as well. It brings more intuitive and cleaner design to the table. Widgets has been moved to another hidden place for good finally. I don’t need to swipe left and right and see my unused widgets. And yes, “Ok google” works fine. I can’t stop to invoke it everytime i get the chance. I’d just wish it could make me a coffee. 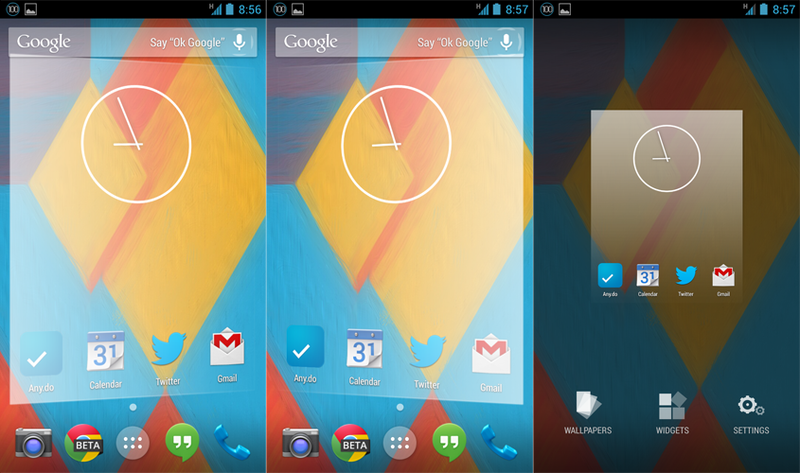 Gone are the days you’d need to rely on third-party tweaks to limit you unused homescreens. 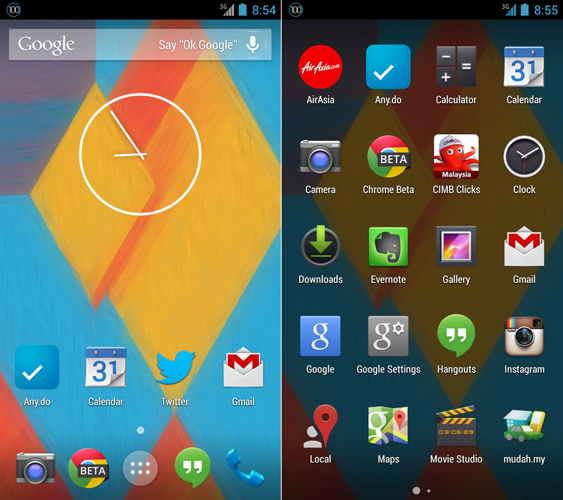 Now stock 4.4 Kitkat launcher would do that for you. Need more homescreen? Just drag you apps to another screen. Just using one homescreen? Swiping left and right won’t switch you to another blank homescreen. Needless to say, just like iOS. Much cleaner interface. And more cute stuff. 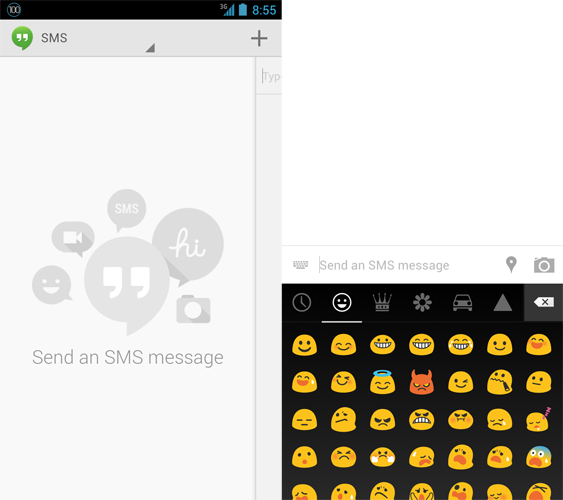 Hangout (v2) now comes with sms function to replace stock Messages. I couldn’t help myself to rm Mms.apk as soon as i tried it. It integrates pretty much everything to make it worth - from Google Talk under one app, to super easy location sharing. Needless to say, it gets much friendlier UI and plenty of cute emoticons to enhance your texting experience. However, it did missed the quick reply feature, but i guess it won’t take long until we see an update to bring this feature back to the party.